All Products > "2220510 HiTec HS7940TH G2 Premium HV Servo"
Hitec's fastest standard size servo the "Ultra Speed" HS-7940TH is designed to operate on a two cell LiPo Pack. Featuring our high resolution "G2" second generation programmable digital circuit and our indestructible Titanium gears, The HS-7940TH has the performance and durability you've come to expect from a Hitec servo. 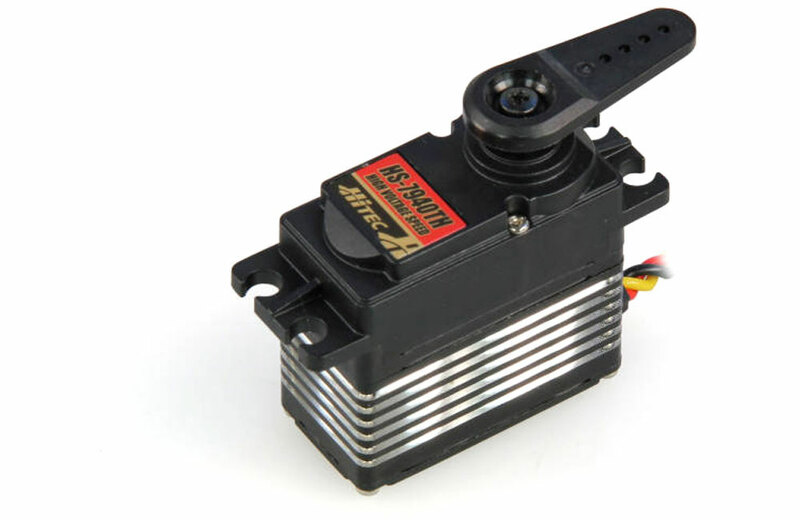 Other features in the HS-7040TH include a 7.4V optimized coreless motor, integrated heat sink case, and a top case with two hardened steel gear pins supported by axial brass bushing. The HS-7940TH has been designed for applications where speed and response are demanded. Perfect for High Performance Nitro and Electric Helicopters, Aircraft, Cars, and Trucks. Featuring a blistering transit time of .07 sec, but still maintaining a respectable 181 oz./in. of torque at 6.0 volts.